We understand many of the concerns and questions you may have when it comes to insuring your vacant buildings. Having a vacant property is always a difficult risk to insure. Many insurance companies will not insure empty buildings or abandoned homes because of the increased risk of a loss occurring. 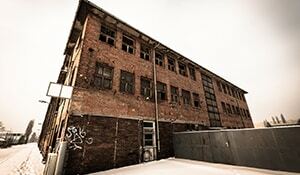 Most standard market insurance companies do not offer coverage for vacant buildings. This type of insurance can be very expensive and hard to obtain. Through years of experience, the agents at Farmerbrown.com will be able to guide you around the obstacles in obtaining the proper coverage for your vacant property to make sure that you are properly covered at a reasonable price. Owning a vacant building can turn into a major promise. Farmer Brown deals in the unique needs of ensuring unoccupied or partially occupied buildings. Whether it be a vacant building, vacant home, or vacant warehouse, we shop multiple insurance carriers to find you the right product. We offer financing if available as well as multiple policy periods from 3 months to 24 months. We understand the complexities insuring vacant buildings and will find the right product that gives you the best value for your insurance dollar. In the event that your home or property becomes vacant for a long period of time, standard building insurance policies will not cover the property. A specialized vacant building insurance or vacant hosue insurance can cover your property during these periods of vacancy from vandalism, damage, loss, and much more. Don’t hesitate to seek out the right information and gather all the facts before making your vacant building insurance decisions. Vacant home insurance, vacant building insurance, or any vacant property insurance is our expertise. It is important to ask many questions and get answers directly from our experts that specialize in vacant building insurance on a daily basis – it’s all we do! In addition to protecting your real estate structure, this insurance may also provide Liability Insurance Coverage to protect you from financial ruin if someone is injured on your property and sues for damages. Farmer Brown has the capability to provide quotes for the hard to place risks and get you insured quickly and conveniently. We have the experience to analyze and recommend the appropriate building insurance coverage for your property. Business assets have one thing in common-they all need protection. Protect your valuable physical assets with quality insurance coverage. By selecting the best policies from the nations top insurance carriers Farmer Brown is able to deliver coverage that represents the greatest value for you. What Are The Key Benefits Of Choosing Us? Farmerbrown.com deals in the unique needs of insuring unoccupied or partially occupied buildings.Whether it be a vacant building, vacant home, or vacant warehouse, we shop multiple insurance carriers to find you the right product.We offer financing if available as well as multiple policy periods from 3 months to 24 months.We understand the complexities insuring vacant buildings and will find the right product that gives you the best value for your insurance dollar.